Metropolitan manufactures a line of custom wood floater frame profiles for paintings on canvas, wood, or gessoboard panels. All our floater frames are available with or without cradles. 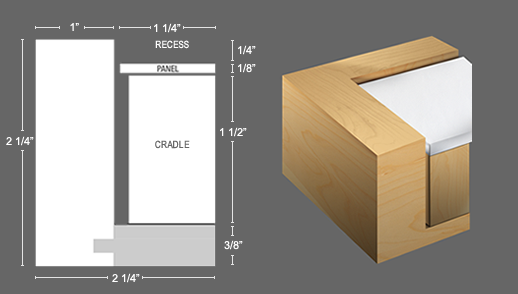 Our floater frames for paintings on panels are available for 3/4" - 2 -1/4" deep cradles in 3/8", 1/2", and 1" widths. Our wood floater frames are available in all the Metropolitan woods and finishes and because we are a manufacturer we can offer many purchasing options. Need inspiration? Visit our customer gallery. The 130 floater frames for panels are designed for extra deep 2-1/4" paintings on cradled panels. All Metropolitan floater frame profiles can be purchased with or without a cradle. The 1" face on this floater frame provides a "substantial" look and is structurally strong enough for larger work. We recommend that all paintings be recessed from the top of the floater frame for protection when handling and moving. The 120 floater frames for panels that are designed for extra deep 2-1/4" paintings on cradled panels. All profiles can be purchased with or without a cradle. The 1/2" face on this frame provides not only a more "substantial" look but is structurally stronger for larger work. We recommend that all paintings be recessed from the top of the frame for protection when handling and moving. The 131 floater frames for panel paintings are designed for 1-1/2" cradles. All profiles can be purchased with or without a cradle. The 1" face on this frame provides not only a more "substantial" look but is structurally stronger for larger work. We recommend that all paintings be recessed from the top of the frame for protection when handling and moving. This is primarily used on larger paintings and is easier to join for customers who are assembling their own frames. 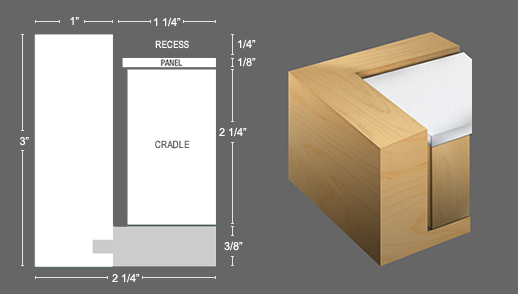 The 124 floater frames for panel paintings are designed for 1-1/2" cradles. All profiles can be purchased with or without a cradle. The 1/2" face on this frame provides not only a "substantial" look and is structurally strong enough for larger work. We recommend that all paintings be recessed from the top of the frame for protection when handling and moving. This is primarily used on medium to larger paintings and is easier to join for customers who are assembling their own frames. 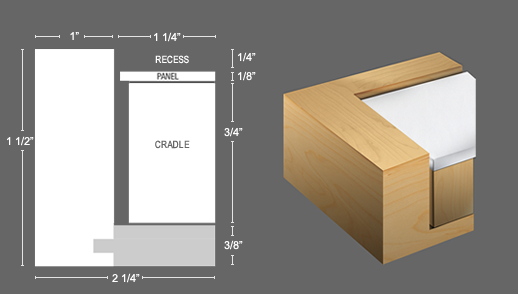 The 121 floater frames for panel paintings are designed for 1-1/2" cradles. All profiles can be purchased with or without a cradle. The 3/8" face on this frame provides provides a minimal look. We recommend that all paintings be recessed from the top of the frame for protection when handling and moving. We recommend using wider profiles for large/oversize frames if you are joining them yourself. 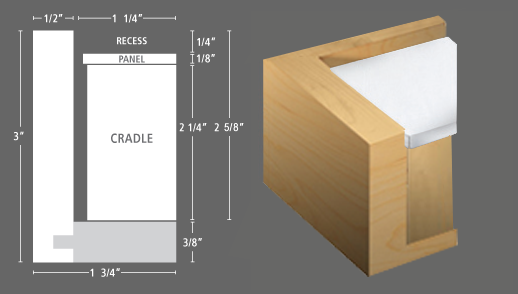 The 132 floater frames for panel paintings are designed for 1-1/2" cradles. All profiles can be purchased with or without a cradle. The 1" face on this frame provides not only a more "substantial" look but is structurally stronger for larger work. We recommend that all paintings be recessed from the top of the frame for protection when handling and moving. This is primarily used on larger paintings and is easier to join for customers who are assembling their own frames. The 123 floater frames for panel paintings are designed for 3/4" cradles. All profiles can be purchased with or without a cradle. The 1/2" face on this frame provides not only a "substantial" look and is structurally stronger for larger work. We recommend that all paintings be recessed from the top of the frame for protection when handling and moving. This wider profile is easier to join for customers who are assembling their own frames. The 122 floater frames for panel paintings are designed for 3/4" cradles. All profiles can be purchased with or without a cradle. The 3/8" face on this frame provides provides a minimal look. We recommend that all paintings be recessed from the top of the frame for protection when handling and moving. The 125 floater frames for panels are designed for contemporary paintings on wood, canvas, or gessoboard panels. We recommend that all paintings be recessed from the top of the frame for protection when handling and moving. See framing advice to learn how to attach a panel to a floater frame for a video and step by step instructions.